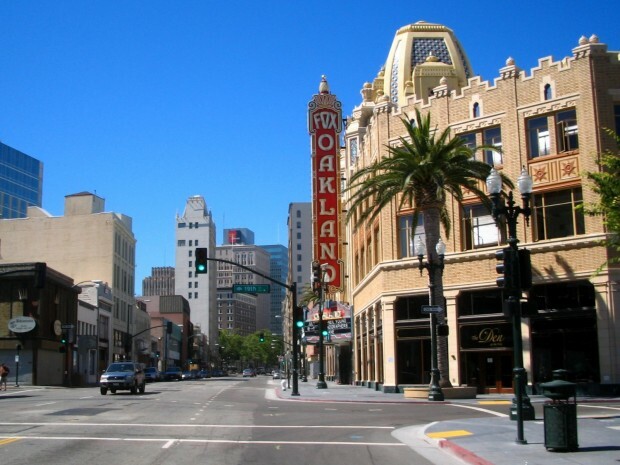 2012 was a year of big changes for Oakland, as the city dealt with its struggling finances, a possible federal takeover of its police department, multiple petitions to recall the mayor and the closure of several elementary schools. Apart from patches of dusty, multicolored chalk art on the sidewalks—a remnant of Chalkupy—little evidence of last night’s march and gathering commemorating the first police raid on an Occupy Oakland encampment remained Friday morning. Despite declarations that the group would hold an all-night vigil, and rumors that they might attempt to set up a new encampment, the only people at Frank Ogawa Plaza this morning were security guards, commuters and City of Oakland maintenance workers. The one-year anniversary commemoration of the first early morning police raid on the Occupy Oakland encampment at Frank Ogawa Plaza has been quiet so far, and a press conference sponsored by Occupy Oakland scheduled to take place at noon failed to materialize. The Oakland Police Department has slid backward in its nearly decade-long effort to comply with court ordered reforms, the independent monitor of the department wrote in a quarterly report released Monday. In May, Rob “Reason” Silver, a part-time record producer from Oakland, and Jason Samel, the owner of a small insurance brokerage in New York, announced their nearly identical but independently conceived plans to bring a new element into the national Occupy protest—marketability. Both had come to the conclusion that there was potential within the anti-capitalistic, determinedly decentralized protest to sell a product that could help raise funds and draw in new supporters. In May, both men launched Occupy benefit albums. Over the past two weeks an impromptu library has sprung up on the location of the former Latin American Library in the Fruitvale district. A group of nearly fifteen people, including a few Occupy Oakland protesters and several community members, have been loaning out books, constructing planters for gardening and holding community meetings. Nearly a year after the Occupy protest coalesced in downtown Oakland, a longsuffering casualty of the protest is finally being attended to as the City of Oakland begins a full-scale restoration of the lawn of Frank H. Ogawa Plaza. The project involves the removal and replacement of all grass sod in the plaza—a new lawn, essentially, from scratch. Barely one week after the Obama campaign office on Telegraph Avenue in downtown Oakland had one of its window panes shattered by Occupy protesters, at least 100 protesters calling for the release of jailed U.S. Army soldier Private First Class Bradley Manning invaded the campaign offices Thursday, occupying them for at least three hours and bringing business to a standstill before police forced them out. After 16 days, the number of tents visible at the encampment at Lakeview Elementary School has doubled and protesters have changed their rules: No one is allowed to know the number of kids or adults who occupy the site in an effort to avoid a police raid. To celebrate the first two weeks of the sit-in protesting the closure of Oakland elementary schools and the launch of the People’s School of Public Education, the tent city residents hosted a community potluck on Sunday, as well as a documentary screening.